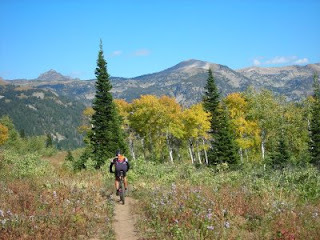 A week ago there was barely a hint of color in the hills around Driggs, but now Fall is in full swing. 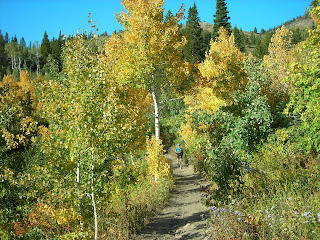 This photo was taken last Sunday on the singletrack trails of Rick's Basin, by Grand Targhee. It was an epic day, and there are more on the way. It feels like this could be one of those fast and furious seasons...similar to the summer we just had. Or, was that just a dream? 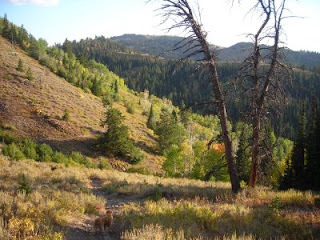 Fall has it all, and what's not to like. 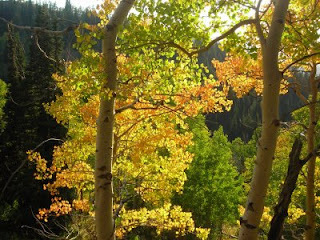 Perfect temperatures, colorful scenery, that lingering glow of summer, anticipation of winter fun, and of course football. If that's not enough, this year we have the added excitement of local and national elections. Here in Teton County, Idaho, we'll be getting two new commissioners to go with one incumbent. Regardless of your preferences, here's hoping this election remains a little more polite than the last one. We continue to experience a lot of changes around Driggs, but with the development slowdown maybe people on both sides won't be quite as riled up this year as they were two years ago. At least we have the right to voice our opinions and vote. Speaking of which, I became very personally interested in the Presidential election the morning of August 29, when McCain announced Sarah Palin as his V.P. running mate. I have been friends with Sarah and Todd Palin since 1995, when R.U. Outside began sponsoring Todd with winter clothing for his Iron Dog snowmobile racing. I've spent time at their home in Wasilla, AK, enjoyed phone calls, lunch, and laughs. Todd even built the booth that R.U. Outside used at the Alaska State Fair for several years. It's been crazy to suddenly see Todd and Sarah on the national scene like this, but they're handling it great. Just two weeks ago, two days after the Republican National Convention, Todd stopped by our booth to say "hello" during our Hay Days trade show in Minnesota...how cool is that? They are the real deal, and a refreshing change from the good-old-boy network. Whatever your political leanings may be, I just have to say this: Todd and Sarah Palin are two of the finest people I have ever known. In the end, watching everything Sarah is going through makes me realize why more good people don't run for public office. It's a grind, to say the least, and my hat goes off to all candidates, everywhere. You people are heroic. Finishing on a lighter note, here's a post-Logan to Jackson bike race photo of me with my cousins Brent (center) and Wade (right). 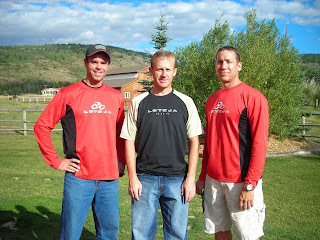 Brent has done the whole 206 miles solo three times now, and Wade was my teammate in the two-person relay this year. Our finishing time of 10 hrs. and 8 min. was good for 6th place out of 54 in our division, and about 200th out of 1,500 overall. It was a huge event, great experience, and maybe the best day I've ever had on a bike. Climbing big mountain passes, riding in a high-speed paceline, and emptying the tank (er, legs) was a complete blast. More details to come once Wade forwards me all the pics.